Any (electric) guitarist knows the problem – as soon as you’ve got more than one effects pedal, your cables become a tangled mess and moving the pedals to practise or a gig is a nuisance. The solution is, of course, a pedal board, and there are many commercially available solutions out there, usually involving some metal bent into shape and velcro. I only use four pedals regularly, so I don’t require a large board. 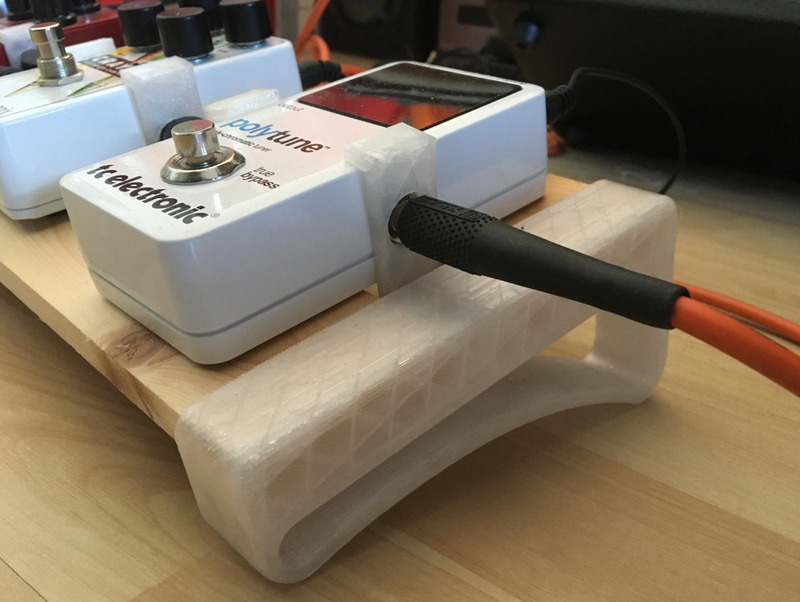 My past experience with velcro for mounting pedals also isn’t very positive (with the velcro on the pedal sticking better to the velcro on the board than the pedal) and I wanted a cheap and compact solution. When I got my 3D printer for my 3D printing business, I started looking around on Thingiverse for guitar-related things. There I stumbled upon this nifty design. I printed the two side brackets and went to the hardware store to get the wood. I had a 12mm thick board of 15cm width cut into two strips of around 6cm wide, and cut them to the desired length at home. They slid right into the brackets, part 1 complete. The question then was, how to mount the pedals? Due to using two strips of wood, there is a slot in between that on most pedals aligns with the cable jacks. I then designed mounting brackets that hold on to the pedal board from below and slide over the jacks and the top of the pedal. They are held in place by the cables, requiring no screws, glue or velcro for keeping the pedals in place. The brackets, including the OpenSCAD file that can be used for designing your own brackets, can be found on Thingiverse, too. The end result currently holds four pedals (TC Electronic Polytune, EHX Crayon, MXR Custom Badass ’78 Distortion, Zoom MS-50G). Total cost involved was just a couple of Euros for the wood and a bit of filament. I used PETG as this is stronger than PLA.